Beerud Sheth is co-founder and CEO of Teamchat, CEO at Webaroo Technology and formerly founder and CEO at Elance. As the number of mobile apps increases while the size of our mobile screens decreases, we’re reaching the limits of the mobile “OS + apps” paradigm. It’s getting harder to download, set up, manage and switch between so many apps on our mobile device. Most mobile users only use a handful of apps every day. 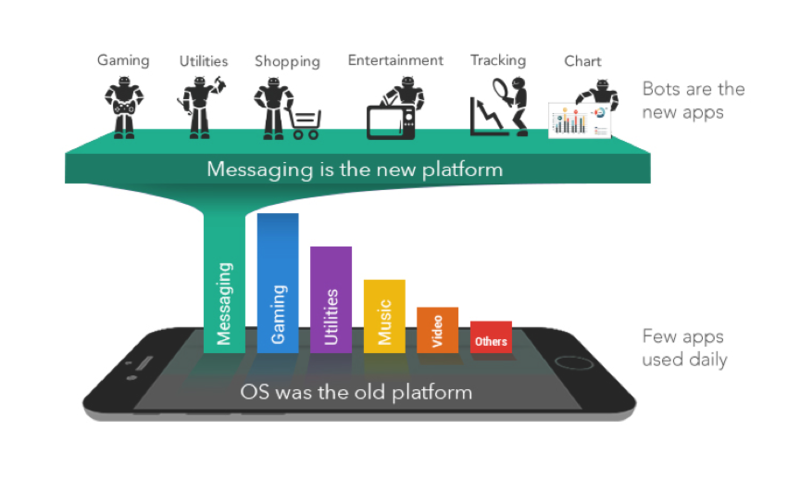 As an alternative, messaging apps are becoming the new platform, subsuming the role played by the mobile operating system. This is similar to the trend in the mid ‘90s, when the browser replaced the desktop OS as the new platform. Just as websites replaced client applications then, messaging bots will replace mobile apps now. Bots, therefore, are the new apps. The bot store is the new app store. WeChat, Line, Facebook, Slack and Telegram are messaging platforms that enable interaction with third-party services from within the messaging interface. Each of these platforms enable developers to build messaging bots to provide automated services through the messaging interface — Facebook M is a good example. Which means we’re at the early stages of a major emerging trend: the rise of messaging bots. Messaging bots can read and write messages just like a human would. Bots can be programmed to carry out automated actions. Bots can both initiate action as well as respond to requests from other users. Bots are of different kinds, too; they automate conversations, transactions or workflows. E-commerce bots enable buying of goods and services. Food bots order dinner. Content bots share relevant content with you (e.g., news, weather). Watcher bots notify you when specific events happen (e.g., your flight is delayed, this car needs servicing). Banking and trading bots provide financial services. Workflow bots automate business workflows in sales, HR, operations, admin, finance, etc. Chart bots summarize data in charts suitable for small screens. IoT bots connect us to our smart homes, cars and devices. Concierge bots provide a wide range of services implemented by other bots. And when all of these bots get to be too much, your Personal Assistant bot manages the communication with the other bots for you escalating only the high-priority requests for which you’ve trained it. However, for bots to function under diverse use cases, the messaging needs to be re-architected. Current message formats are limited to plain text, which require the bots to have natural language processing capabilities to communicate with humans. However, there are limits to the precision or efficiency of computer-based natural language processing. Natural language isn’t the best way to capture an order, a travel booking, an approval, an invoice, a survey, a registration form or any other structured content. If a message format remains plain text, it either limits the capabilities of the bot or requires multiple iterations to precisely specify the request. So now we have “smart” messages that structure content, like mini-web pages, to enable precise and efficient communication between bots and humans. Bots can customize smart messages to render the structured information, to capture user response and to act further on them. The framework of bots, along with smart messages, enables replication of virtually any site or app onto the platform. Almost any transaction or workflow can be mapped to the messaging framework. Messaging bots offer benefits, as well. Bots de-clutter our mobile experience. Bots send us a message when we need to know or respond to something, but stay invisible otherwise. Bots reside in the cloud and upgrade themselves with new functionality — without any user action. Bots can interact with one other and can be chained together to perform a series of actions in sequence. Bots can supervise other bots, leading to bot hierarchies. It’s a brave new bot-filled world, with new possibilities and new risks. Your personal bot will supervise other bots on your behalf, per your personal preferences. You may choose to delegate authority to bots that act autonomously on your behalf. Your shopping, scheduling, tracking, monitoring and messaging can be automated according to personal preferences. Your bot can even filter advertising messages sent to you — in fact, in a world of perfectly informed bots, traditional advertising may have a diminished role. It’s a brave new bot-filled world, with new possibilities and new risks. Bots are currently available at a bot store (on Teamchat), not unlike today’s app store. Initiating a conversation with the bot is the same as starting a chat with a friend — no download required. And the user interface for bots is a message. You just send and receive messages from the bot. No need to learn, understand and navigate disparate interfaces or languages. Users will be able to interact with bots just as they interact with other humans. It’s the most natural way to communicate and transact. Two decades ago, the paradigm shift on our PCs from “desktop OS + client” applications to “browser + website” led to a massive shift in the tech industries. We are on the verge of a similar shift on the mobile device, with even bigger consequences — given the fact that no one can live without theirs.